Pickuptrucks.com's 2010 Heavy-Duty Shootout has dropped and it's their biggest comparo ever: nine heavy duty trucks, 3402-hp, 5845 lb-ft of torque, and copious truck abuse. We pitched in and got our first look at the impressive GMC Sierra Denali HD. When Pickuptruck.com's Mike Levine called us up wondering if we'd be interested in beating some heavy duty trucks fo fun, the obvious answer was yes. 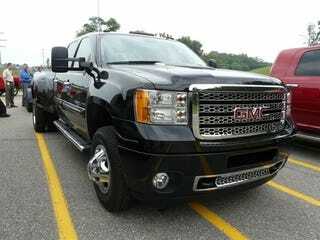 Of the steel he'd assembled, the one we haven't spent much time with is the GMC Sierra Denali HD. It's the first application of the high-zoot Denali trim to a heavy duty truck and it seems like GM waited until they had all the right ingredients before letting it loose. While this latest generation of GM trucks doesn't wear substantially new sheetmetal, the goods underneath have been seriously upgraded. A new frame, bigger brakes, heavier axle and a heavily revised Duramax engine contribute to a beefy work truck. The Denali HD from GMC takes all the hardware goodies you get from the Silverado HD and wraps it in a very handsome, tough-guy styling package. The outsides feature a huge chrome grille, very nice shiny wheels, running boards, and a premo interior. We didn't spend a whole lot of time with the Sierra HD, but we did join Mike's testing barrage when he was towing beefy trailers up the grades at GM's Milford Proving Grounds. Of all the trucks we hopped into during the day, the Sierra HD showed some serious chops. What's that now? Isn't Ford the king of the hill when it comes to HD trucks? You'll have to hit the mega post at Pickuptrucks.com to find that out, but from an uphill towing perspective, the Sierra was king. Let's not be mistaken here, Ford, GM and Dodge all have beefy monsters in the HD department, but when it came to drag racing up the hill, the Sierra Denali was no joke. The Ford was up on power but its traction control system absolutely killed forward momentum. Dodge's Cummins is always reliable but was regularly bested by the more-powerful GM truck. Engine braking downhill was another area where GM's made huge steps forward. Used to be Ford crushed the GM trucks in this arena, but running a 10,000 lb trailer down a grade is easy as pie. In fact, there isn't much not to like about the Denali, aside from the obnoxious faux wood inside (seriously GM, get rid of that garbage, Buick's got gorgeous fake wood, use that). We're no experts on trucks though, so if you want the real breakdown on all that is heavy duty pickups, head over to the big comparison at Pickuptrucks.com.